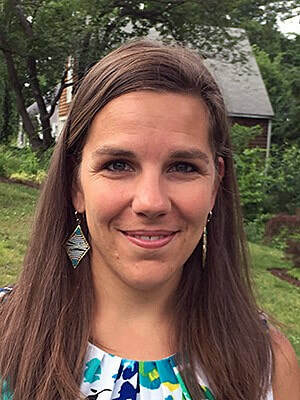 ​Katharine Correia is an Assistant Professor of Statistics at Amherst College whose second semester is underway. She is currently teaching Intermediate Statistics and Introduction to Statistics via Modeling for the Spring of 2019. She is a member of the Faculty Learning Community on Inclusive Pedagogy. Professor Correia received her B.A. at Mount Holyoke College in 2007, her M.A. at Boston University in 2009, and her Ph.D. at Harvard University in 2018. At Mount Holyoke, she did not go in with the intention to pursue STEM but had to take some courses due to the general requirements. Math had been easy for her in high school, so she took a statistics course, believing that it would not be difficult. It was, in fact, difficult, but she ended up loving the professor and the subject. She became interested in using statistics investigatively after being inspired by a guest speaker in her statistics class who discussed the use of statistics in the courtroom. In the summer between her junior and senior year, she interned at the Summer Institute for Biostatistics Research, which further fueled her passion for statistics. After receiving her Masters Degree from Boston University, she worked at the infertility clinic at Brigham and Women’s Hospital in Boston as a biostatistician. While she enjoyed her career there greatly, Professor Correia decided to pursue her Ph.D., with the encouragement of her boss and coworkers at the clinic. When she started her doctoral program at Harvard University, though, she was also caring for her six month old baby. As a result, she lost a lot of weight and sleep balancing these obligations, but was able to push through with the supports in place at the University and the help of her advisor, also a woman with children. From her experiences at Brigham and Women’s Hospital, she developed a research interest in In Vitro Fertilization. In Vitro Fertilization is a assisted reproduction process that involves fertilization of the egg and sperm in the lab and then inserting the resulting embryo into the uterus. ​Professor Correia wanted to pursue a career that included teaching in a classroom which influenced her interest in working at a liberal arts institution instead of a research institution, the latter having little investment in teaching. In her classes, she tries to incorporate specific examples that relate to the students’ interests and make statistics applicable to their lives. She tries to frame her class in a way that makes students comfortable talking in class by sharing her own interests and personal story, then having students do the same. In the future, she is interested in creating a course on statistics in medicine geared toward students that are interested in pursuing the health professions.